PQ Labs iStick A200 is a Rockchip RK3066 Android 4.1.1 mini PC with 2 GB RAM, 4 GB Flash, an HDMI (female) output, a USB 2.0 Host port, and a miniUSB port for power. Pretty boring stuff if you ask me… And I would not be writing about it, if the company hadn’t interfaced their infrared touch frames to this mini PC to allow 10-point multi-touch on a large screen or projector output, making it a pretty good solution for conferences and interactive digital signage. The device ships with a 5V/2A power adapter, a miniUSB o USB cable, an HDMI cable, and a tiny user manual. It costs $79 on PQ Labs e-Store excluding shipping (To Thailand, I’d have to pay $99 with shipping), so unless you’re going to buy/use it with the touchscreen there’s very little reason to buy it at this price. On the contrary, if you need to use a touchscreen for your application, it should be worth it, and you’ll probably find the demo below pretty good. The first part of the video (until 2:20) shows the unboxing of this mini PC, and the rest of the video shows the mini PC in action. It’s connected to a projector via the HDMI port, and to PQ Labs G4 series Overlay Touch Frame (40″ model) via USB. The reviewer runs some demo apps such as 3D Browser, 3D Mountain and Google Earth to show 3D rendering and multi-touch capabilities, he also demos a Win8 launcher (also found in some tablets). Some digital signage specific features such as time on/off and portrait orientation are also showcased, and finally he starts YAMTT (Yet Another MultiTouch Test), and 2-point tracking is very fast, 10-point tracking works but a little sluggish, but the reviewer said it’s because of the touchscreen and G4S series models should perform better. PQ Labs does not sell their touch screens online, but Peau Productions, a reseller and the one who did the video below, sells the model used above (G4 Overlay 40″) for $574. 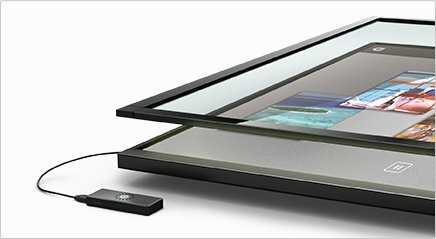 There are lots of different options for the touch frames including G4 or G4S series, overlay (with glass) or integration kits, and different sizes (32″ to 65″). They also sell other sizes (70″ to 103″) but I’m not sure if those are compatible. PQ Labs also provides an SDK for their touch frames but it’s only available for Windows and Mac OS, so you may not be able to just interface PQ Labs touch frame with any Android devices. iStick A200 : Une clé PC pour écrans tactiles. Can you point me to any mini/stick pc and its online shop having a RK3066 dual core SoC with 2GB DDR3 RAM? Sorry but all 2GB RAM mini PC come from funny places… I’ve just seen S21H has been downgraded to 1GB RAM in many shops. Other options are MK812 (but there are 2 version: 1GB and 2GB), and the one above. That’s all I can remember for now.